Cassie and the Bobs will take you on a musical journey back in time. Imagine it is the early 60's and you are at a concert featuring the biggest female singer in the country, Patsy Cline. THAT is the experience you will get as you watch this show. Sponsored by Crossings at the State Theatre on Sunday, Apr. 7, at 2pm. 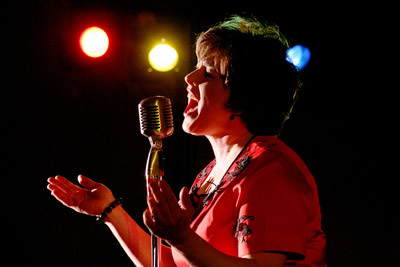 Cassie and the Bobs is the mid-west’s best Patsy Cline tribute show. While there are many “ Patsy imitators, “ you will not hear anyone come as close to sounding like Patsy Cline as Cassandra Wiese. The Bobs are a full group of accomplished musicians dedicated to sounding as authentic and true to the spirit of the original recordings as possible. The group continues to draw hundreds of people to their performances, a testimony to the quality of their show and the enduring popularity of Patsy Cline more than 50 years after her death. Cline was a pioneer of the 1960s Nashville sound and as a female headline performer. She had attained great success by age 30, when she died in a private plane crash. She remains a major influence for many singers and is one of the most acclaimed female vocalists of the 20th Century. She was posthumously inducted into the Country Music Hall of Fame – the first female soloist to receive that honor. Don’t miss the extraordinary voice and show of Cassie and the Bobs, and... The Music and Magic of Patsy Cline. Tickets are $18 in advance or $21 at the door.